During the last decade, a large number of QTLs and candidate genes for rice tolerance to salinity have been reported. Using 124 SNP and 52 SSR markers, we targeted 14 QTLs and 65 candidate genes for association mapping within the European Rice Core collection (ERCC) comprising 180 japonica accessions. Significant differences in phenotypic response to salinity were observed. Nineteen distinct loci significantly associated with one or more phenotypic response traits were detected. Linkage disequilibrium between these loci was extremely low, indicating a random distribution of favourable alleles in the ERCC. Analysis of the function of these loci indicated that all major tolerance mechanisms were present in the ERCC although the useful level of expression of the different mechanisms was scattered among different accessions. Under moderate salinity stress some accessions achieved the same level of control of Na+ concentration and Na+/K+ equilibrium as the indica reference variety for salinity tolerance Nona Bokra, although without sharing the same alleles at several loci associated with Na+ concentration. 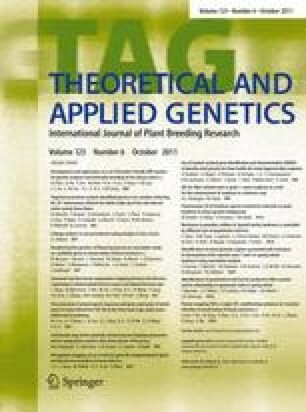 This suggests (a) differences between indica and japonica subspecies in the effect of QTLs and genes involved in salinity tolerance and (b) further potential for the improvement of tolerance to salinity above the tolerance level of Nona Bokra, provided the underlying mechanisms are complementary at the whole plant level. No accession carried all favourable alleles, or showed the best phenotypic responses for all traits measured. At least nine accessions were needed to assemble the favourable alleles and all the best phenotypic responses. An effective strategy for the accumulation of the favourable alleles would be marker-assisted population improvement. The online version of this article (doi: 10.1007/s00122-011-1634-4) contains supplementary material, which is available to authorized users. This research was implemented in the framework of EURIGEN project funded by European Commission—DG Agriculture and Rural Development within the AGRI GEN RES program. Sónia Negrão also thanks FCT-Portugal for the Post-Doc fellowship SFRH/BPD/34593/2007.